Piggles Goes to School... the video trailer. On his first day of school Piggles worries about everything. But Piggles learns to think for himself as he outsmarts dinosaurs, a witch, a goblin, a UFO, a dragon and a pirate. Filled with puzzles and interactive fun, Piggles loves school once gets there. 'Piggles Goes to School' challenges children to think for themselves and overcome problems as they travel with Piggles on his way to school. Touching objects initiates sounds, actions, animations. 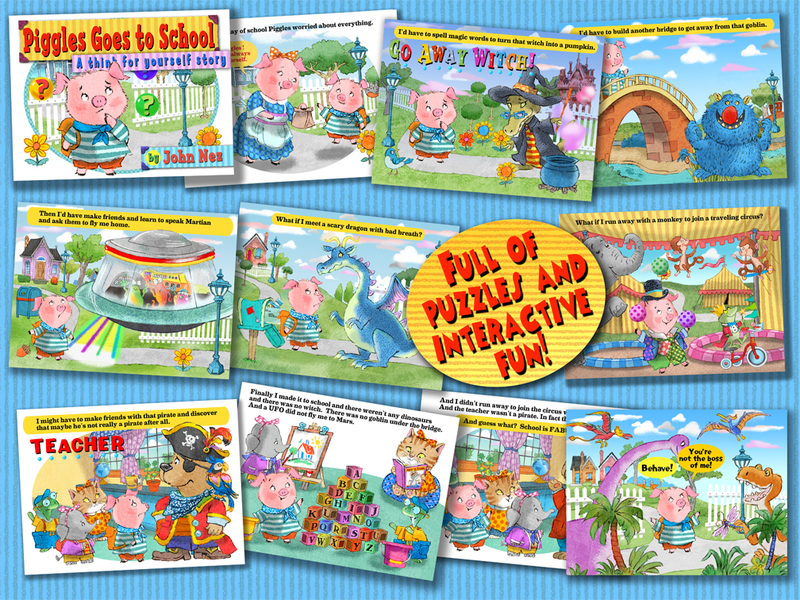 Help Piggles solve a variety of puzzles to make his way safely to school. When a book-maker gets a book in a box on the porch it's always a thrill to open it up and see it 'for real'... finally. This same rule applies to e-book apps... only more so. I had the wonderful opportunity to finally download my 1st copy of 'Piggles Goes to School' onto my iPod touch. To savor the experience I quietly stole away to my favorite cafe to plug in my headphones and push the 'Read to Me' button on my iPod. On the scale of the quiet joys of book-making this first reading rates up near the top. It's the first time ever that you get to be 'the reader'. I was not disappointed. This new book is an actual book, whereas Mousey the Explorer was sort of an improvised idea on a theme. 'Piggles Goes to School' has an actual storyline, plot, resolution and all that. 'Piggles Goes to School' is available from InteractiveTouchBooks.com, an iTunes store.